All homebred EL Minja's Lhasa Apso's! Best in Shows, Group winners and placements, Winner titles and many Championships! Most winning Lhasa Apso kennel in the Netherlands and Belgium, most succesfull homebred breeder of group 9 companion and toys. 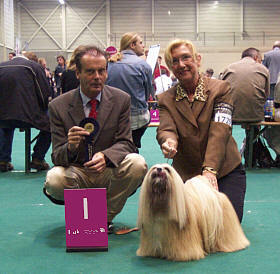 Latest dogshow 2003: 21 December, 26e Int. 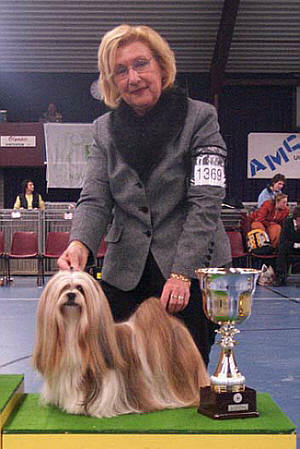 Christmas Dogshow at Wijchen in the Netherlands, Multi CH EL Minja's Dream On won Best Lhasa Apso female with CAC/CACIB and she also won Best of Breed . Thank you judge Mr Hans Boelaars from the Netherlands. 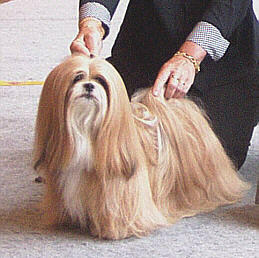 Multi CH EL Minja's Dream On finished Res.Best in Group under Judge Mrs. A.Stuifbergen-Hoetjes. 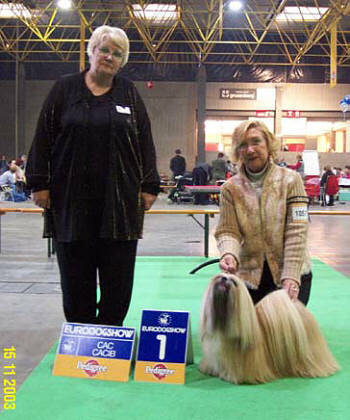 13 December, Brussels Belgian Winner dogshow, Brussels is the capital of the Kingdom of Belgium; Brussels is also the Council of the European Union. BIS,BISS,Multi Champion EL Minja's Thsang-Pa won again his title of Belgian Winner this time for the year 2003 , Thsang-Pa obtained last year also this title Belgian winner 2002 and finished 4e Best in Show!!! 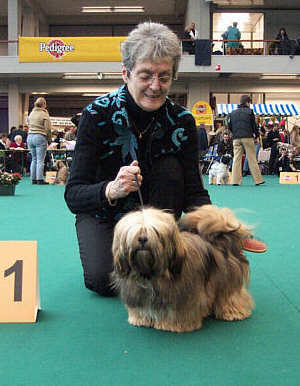 Multi CH.EL Minja's Good as Gold won last week her Title "Amsterdam winster 2003" and now she won at the Brussels dogshow her title of Belgian Winner 2003 and won Best of Breed under judge Mrs Maria De Wilde-Voet. Multi CH.EL Minja's Good as Gold won 2 Great Champion titles in 1 week .............Megan and Kyli are very proud on their mum! 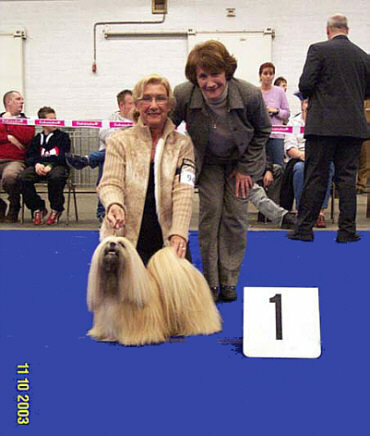 Multi CH EL Minja's Good as Gold "Amsterdam Winster 2003 & Belgian Winster 2003"
7 December, Amsterdam Winner dogshow, multi CH.EL Minja's Good as Gold won The Title of "Winster 2003" Amsterdam under judge Mr P.Prins, our Lhasa Apso female puppy Nirvana Dar Tibetu ( by CH EL Minja's May Boy) won best puppy of the breed, thank you Gerda for showing her. 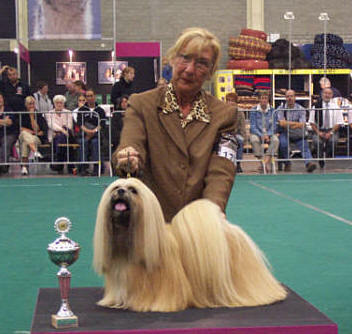 November 15, 2003; 40th EURODOGSHOW EXPO KORTRIJK, BIS,BISS,Multi Champion EL Minja's Thsang-Pa won Best of Breed under judge Mrs Valentina Ivanichtcheva from Russia. Oktober 25, 2003; BIS,BISS,Multi Champion EL Minja's Thsang-Pa won Best in Show in Germany and multi CH.EL Minja's Good as Gold won her last ticket for German Champion now she has another champion title added to her list, she is the proud mother of two litters and a proud Champ kennelmate of Thsang-pa.
Ch.EL Minja's Thsang-Pa win Best in Show again! excellent bite, well proportioned body, excellent brisket. Straight forelegs! 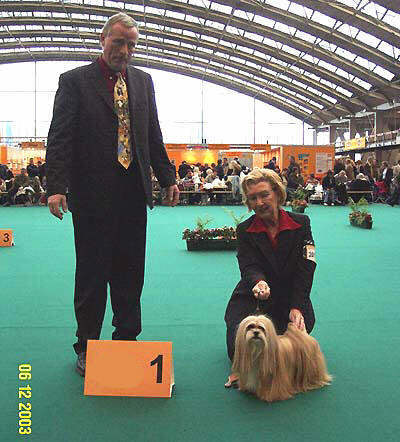 September 28, 2003; International Dogshow in Maastricht MECC complex, BIS,BISS,Multi Champion EL Minja's Thsang-Pa won Best male with CAC/CACIB and Best of Breed under Judge Mr Hans van den Berg from Holland and obtain again a group9 placement now 3 under Mrs Inneke Zwaardman Pinster. BIS,BISS,Multi Champion EL Minja's Thsang-Pa Groupfoto at Maastricht. BIS,BISS,Multi Champion EL Minja's Thsang-Pa and judge Mr H van den Berg. 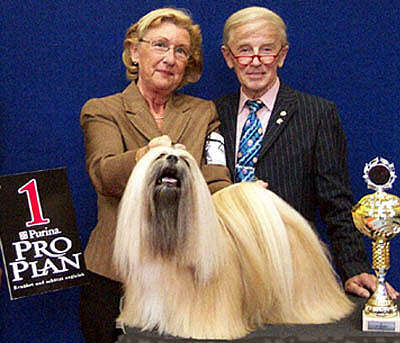 "EL Minja's Lhasa Apso dogs, Proven quality!"